What’s the difference between a great song and one that’s merely good? Is there a checklist of attributes you need to hit to make it to the next level in terms of quality? When one of those components is lacking will that be enough to guarantee that it will drop down a notch or can overachieving in the other areas make up for it? Will a song that achieves perfect scores in each area be assured of netting the artist a Top Ten hit? If their success rate in hitting all of their artistic marks is only 85% will it only crack the Top 40? Producers would love if music could be reduced to that kind of simple formula because it’d make their job so much easier. You’d be able to put together a record and then simply go down the list and when you found an element that was weaker than the recommended level you’d get to focus on that aspect in isolation and plug in a replacement part that met the acceptable standards. The formula though isn’t simple, nor is it the same from artist to artist, or even song to song. Music isn’t stagnant so there can be no precise formula to follow each time out to ensure optimum returns. Annie Laurie and Paul Gayten had been working together for over two years and had tried more formulas than you’d think possible for such a short period of time. You could argue they were commercially unsure of themselves at times, well versed in pop, blues, jazz and rock and so each choice was going to potentially appeal to just one constituency and their focus jumped from one to another rather than sticking with only one, but the better “criticism” of that habit is to say they were artistically curious and so they’d pursue different approaches to see how well they could pull each of them off. The problem with that however can be that you wind up abandoning each one before you actually hit on the best formula for it to connect. That’s been what has hamstrung them more often than not. They trade out old problems they’re close to solving for new ones they didn’t need to take on rather than simply consolidating their gains, shoring up their remaining weaknesses and inching closer to perfection in the process. As a result of this, for all of their obvious talent and even their compatibility together on a wide array of material, you always get the feeling listening to them that they’re still not living up to their full potential. It’s as if they aren’t fully able to tap into the precise formula that is required to be consistent hit makers. Once again that’s the case with Cuttin’ Out, a good song with a lot of upside whose nagging shortcomings seem rather evident and thus easily fixed. But when you are cutting records in real time those same problems prove to be much more elusive to harness in the studio. The first interesting choice, and one that effects the entire record obviously, is the niche this composition falls under, that of a torch song. Always a viable option for females of all styles of music, from jazz to pop to rock, it also benefits from probably having among the most easily followed formulas to make work. In other words, the game plan for this type of song is well-established and suits Laurie’s skill set pretty well. She’s a measured vocalist by nature, possessing a good voice but she isn’t someone prone to over-emoting just to prove she can. Her tone is particularly interesting in its nuances, warm sounding with a slightly shrill shade to it when she goes up in register. It’s a voice that has character, hinting at things going on under the surface and that bodes well for any song which requires her to lament over a love gone wrong while keeping it devoid of all rancor and bitterness. 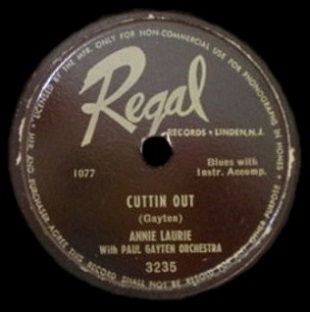 Cuttin’ Out was written by Gayten himself, which means he not only tailored it for Laurie’s singing, but also presumably for his own band’s strengths. It features a melody that’s seductively inviting. Like almost all torch songs it stays in low gear throughout but to avoid having it drag he’s included a few subtle surges in its pacing, a deceptive trick that gives the arrangement an anticipatory feel to it in places. The two entities, Laurie’s singing and the arrangement as conveyed by the band’s playing, are in perfect in sync throughout much of this, swaying lightly but with a bit more gravity to it than that term suggests. It’s a song that will get stuck in your head after a spin or two, something which obviously is the goal for almost an artist and producer looking for a hit. Laurie is also given some good lines to deliver within the context of the basic message that she’s had enough of her man’s disregard for her after he’d worked hard to get her by putting his best foot forward, making promises and showing her unconditional love. Once he had her though, like many guys at the center of crumbling relationships, his attention waned as did his desire to see to it she remained the focal point of his happiness, and she grew disenchanted enough to leave him. Some of these jabs at him find their target with unerring precision, the best of which comes in the refrain which acts as the chorus, telling him pointedly that “If I stay here another day you’re going to drive me out of my mind”, something which is far more cutting than just saying he’s a boorish jerk and stomping out the door in a huff. In that situation he’d be able to easily dismiss her anger and shift the blame to her, saying she’s upset at something specific he did, which he might convince himself would soon blow over or that he’d at least be able to justify if it came to hashing out their differences over dinner. But when she reduces her reasons for leaving him to the simple fact he’s not good enough to hold HER interest anymore, that she’s bored and dissatisfied with his very existence, all of his counter-arguments that he had lined up crumble. Without so much as raising her voice she’s reduced him to an irrelevancy without risking him delivering any form of verbal retaliation that could turn the tables on her. It’s a brilliant piece of psychological warfare. Unfortunately it rests on these laurels midway through the song, repeating the same lines without revealing any more details. This is a common flaw in so many songs, allowing a really good concept to be starved to death by not feeding it (and us) more juicy details. Because of that Cuttin’ Out is sharp in its intent but comes up increasingly short lyrically in its follow-through as it goes along, forcing Laurie to do all of the heavy lifting to keep you focused by how she delivers the same lines again. If Laurie could overcome a song that seems to be somewhat half-completed, or at least lacking a strong resolution, her task becomes more difficult, especially competing in a rock setting, with the blander instrumentation used by Gayten to give the song its color. His own piano behind her in the verses is quite effective as it impatiently stabs at a note which perfectly reinforces her lack of interest in the guy she’s leaving behind. Picture it as she herself drumming her fingers on a counter-top as he’s trying to talk her out of it and her finally telling him she has somewhere to go, or someone else to meet, and she can’t stick around to hear his excuses anymore. That’s what Gayten is projecting here and it fits in well with the theme as well as providing a clever counterpoint to the otherwise slow pace of the song. But he falls into the trap of equating torch songs with a more sedate pop-jazz backing as delivered by droning horns. It’s not as if he doesn’t have eminently skilled musicians to give this a different feel that would haul it more into a rock mindset while still keeping it bound to the torch song aesthetic. On Cuttin’ Out she’s in control of the situation from the start, giving her the requisite attitude for rock music. Her voice reflects that confidence and for the most part the backing helps her cause, at least when she herself is leading the way. But when it comes to the breaks where she steps aside and the musicians take over they revert back to the more pop sentimentality of her earlier pop efforts such as Waiting For You which adorned the flip side of her rockin’ Annie’s Blues back in February. The sax solo here might never get quite so maudlin as that but it also has no direction, no sense of purpose other than as a space filler. It wanders around, playing pleasant but inconsequential riffs in a dreamy tone. Its incompatibility becomes glaringly apparent with the stop-time framework that follows when Laurie jumps back in to declare she’s headed for the train and out of this guy’s life. It’s the dramatic plot point of the song and yet it was led into by a solo that acted as if you had all the time in the world as you lazily talked it over on a Sunday morning. In other words, they had a lot of components, from the the overall theme, Laurie’s vocal tone and some suitable smaller elements that were really strong, but then they pulled up short and weakened the entire package by diluting the formula, not quite derailing it as much as simply making it somewhat nonessential. Yet it was a hit. A genuine national Top Ten hit. The second of her career and the first she scored in the rock field. That feat also made it just the second national hit for a female rock artist in the two years since the music came on the scene – after Chubby Newsom’s salacious Hip Shakin’ Mama, also backed by Gayten. Hit or not, this is merely a good record, not a great one, but that’s not to say it couldn’t have been far better with just a few simple changes. We’ve gone down the checklist and marked off the ones they missed, but how do they keep the basic structure intact while putting more power under the hood? For starters you need to have some escalating charges in the lyrics and then a kiss off that stings far more than what they give you. Since the chorus isn’t done with a different melodic approach than the verses are it makes the words they’re using for its construct far more pliable. All they need to do is tweak it each time through, taking her from merely saying he’s GOING to drive her out of her mind, to saying if he thinks she’s going to stay then HE’S out of his mind, and finally wrapping it up by declaring that once she’s gone he’ll never even cross her mind. 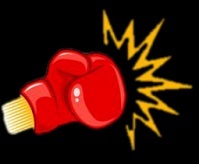 Jab, stiffer jab, hard right hook, knockout. Musically the horns need to be vastly improved, from the intro to the work behind Laurie on the verses, taking it farther away from the higher register which gives the whole thing an atmosphere that is far too pleasant for the material, as if she was only mildly annoyed and not on the verge of leaving, and replace it with a more ominous feel. Tenor saxes taunting the recipient of her put-downs with something that evokes a chiding impression. When it comes to the sax solo itself that has to be drastically cut down to size and be far more aggressive in every way. There’s no need for it to honk and squeal, besides that wouldn’t fit here at all, but by giving it a deeper tone and more grinding hard-edged riff that implies mounting dissatisfaction on her part it would give the song a much stronger core and lead seamlessly into the stop-time vocals that come out of that section. 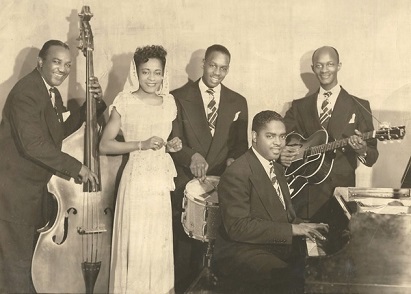 The basic melody would be unchanged, they certainly had the musicians on hand to deliver that kind of altered blueprint, and it still would be recognizable as a torch song, the difference is it’d have far more bite to it. But of course that’s not the case in real life, where half of a good idea and execution results in nothing more than a halfway decent record. But I’m sure their retort would be that this time around it was at least a halfway decent HIT record and so they were free to move on to try yet another formula next time around. Leave a reply on "Annie Laurie: “Cuttin’ Out”"